Stop popping your head up out of your cube like a prairie dog when you can covertly extend your Cubicle Periscope, keeping tabs on your scheming office mates and becoming a master of workplace intrigue. Sure, we've seen cubescopes before, but this one takes on a new level of sophistication, with its 5x zoom and 15-22 inch height range. The picture above has us scratching our heads—doesn't the guy realize we can see him through the glass? Yeah, that's see-through glass, buddy. And that little notation about "smells cookies" on the left might reveal exactly what it is he's looking for. The scope was originally designed for sporting events, letting you see above crowds. That explains its serious construction and $60 price. It looks quite durable, suitable for the highly mobile paintball player, and includes a carrying handle and its own strap-on case. 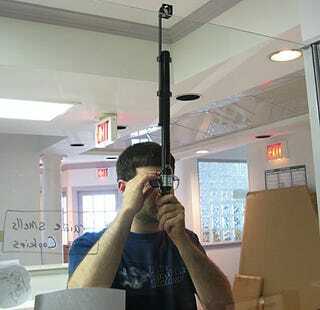 Apparently this is a tool for those who take their office spying seriously.